The Enchanting Chronicles begin with Akarnae. A student (teenager) unexpectedly lands in a different world, that world is far more advanced/ superior than the world we live in. This student lands up in an academy in that strange world finds two more students who have a similar wavelength as hers. These three become very close friends. This trio, two boys and a girl find themselves knocking on the doors of trouble every now and then for reasons oblivious to them. If Harry Potter, Ron and Hermione came your mind after reading this, it’s entirely not your fault, those guys are pretty famous aren’t they? Like most of us, our author too was (I doubt if she is still) lamenting the fact that she did not receive the invite to Hogwarts. Instead of wasting more time on the heartless @ Hogwarts our author decided to create her own wonderland and is inviting us to join her on her joy ride. As I enjoyed mine, I wish to tell you as to what awaits you in that ride. Here is standard description of the ride as given on Goodreads. With just one step, sixteen-year-old Alexandra Jennings’s world changes–literally. Dreading her first day at a new school, Alex is stunned when she walks through a doorway and finds herself stranded in Medora, a fantasy world full of impossibilities. Desperate to return home, she learns that only a man named Professor Marselle can help her… but he’s missing. While waiting for him to reappear, Alex attends Akarnae Academy, Medora’s boarding school for teenagers with extraordinary gifts. She soon starts to enjoy her bizarre new world and the friends who embrace her as one of their own, but strange things are happening at Akarnae, and Alex can’t ignore her fear that something unexpected… something sinister… is looming. An unwilling pawn in a deadly game, Alex’s shoulders bear the crushing weight of an entire race’s survival. Only she can save the Medorans, but what if doing so prevents her from ever returning home? Will Alex risk her entire world–and maybe even her life–to save Medora? I knew Lynette Noni as a blogger, I liked one of her articles and subscribed to her blog. I liked her blogs and when I knew that she wrote a book I wanted to read it. I was lucky that she gave me a chance to review her book “Akarnae”. Now lets get back to the wonder world that she created for us. As the blurb says, Alexandra Jennings lands in “Akarnae” under mysterious circumstances, she was to go to a boarding school and ends here. Thankfully she meets Jordan and Bear who are more than happy to help her adjust to the new world. The technology that’s used in this world sounds magical and subjects that are taught in the academy are also totally different. The author spends good time on setting the ground and then lets the story take off. This is a time tested methodology and the author uses this one very well. She keeps planting her seeds and would use them later in the story, I liked the way she approached the story and the way she narrated it. I liked the way the story was moulded around the library. The author drops enough hints early on to find out as to who the villain is going to be. It was done very wisely and the mystery around that persona was well safe guarded. One would also enjoy the mystery that revolves around the principal of the Academy. I also liked the concept of gifts, festivals and the contributions these things make to the story. I idea of gifted children was also awesome. Keeping the audience guessing is a fantastic tool and Lynette uses it well in Akarnae. Love stories are so common in the books we read and in this book we see that the protagonist admires and respects many boys. In fact her closest friends are boys. However, you would not see any love story in the book. The author makes sure that you cannot even guess the one who would coming close to her in the later parts. (As the readers know Akarnae is the first book in the Medoran Chronicles series.) To me she did a very good job by keeping the people guessing. Coming to the areas that could have improved. The subjects Alex and others are learning and the technology they are using don’t go hand in hand. Shouldn’t the protagonist question the reason for this glaring gap ? I think the author must factor in for this. That was the only qualm I had in the otherwise flawless book. All in all a refreshingly new attempt in weaving a fantasy. The story line is very good and has the potential to go places. 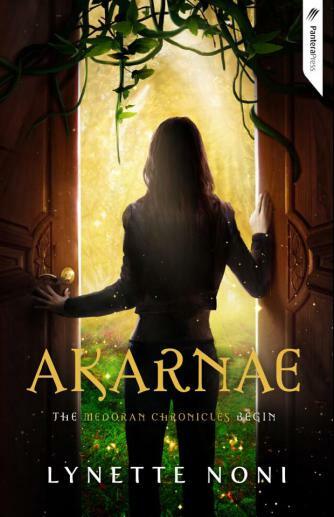 Akarnae sets high expectations for ” The Medoran Chronicles”. Lynette has done the first part very well and I wish her all the success for the subsequent parts. Do read the book, it is a nice work of fiction and you would enjoy the read. Happy reading. I thank Net Galley, the publishers and the author for the opportunity. Your opinion about this blog…….